I remember a day when organizations might actually give an award to a student and NOT give one to everyone else. In 6th grade I was nominated by the coolest 6th grade teacher in the world, Mr. Jenkins, to be in the running for student of the year – the top 6th grade graduate among the 6 other 6 grade classes at Centralia Elementary school. This was a big deal but something happened that would change everything. His name was MARK – a big bratty momma’s boy who lived on my street, who would not stop beating up all the younger kids in our neighborhood when I wasn’t around. The neighborhood Moms repeatedly went to Marks Mom asking her to get him to stop – but he wouldn’t. So, finally, after several more of my young friends got beat up, I tricked Mark into meeting me at the local high school and beat THE SNOT out of him. The very next day right before school began, my super cool teacher Mr. Jenkins, walked by and said, HOW could you have done that- after I nominated you for student of the year – I was crushed. I was sent to the principal’s office; was asked a lot of questions, faced a lot of accusations from Marks Mom and walked out defeated. The day of the graduation came, and at the conclusion was the big announcement. I knew I had already LOST, so… I was ready. Then the principle announced my name, it took me some time to believe it as the entire elementary cheered and clapped. I honestly think the principal didn’t like Momma’s boys, or their Momma’s. And I know the school kids didn’t like Mark. I was CHOSEN undeservedly, I was ELECTED to get the honor. Out of all the selfish sinning bratty 6th graders, I was SELECTED. Look at the end of v1 … who are chosen 2 according to the foreknowledge of God the Father, by the sanctifying work of the Spirit, that you may obey Jesus Christ and be sprinkled with His blood: May grace and peace be yours in fullest measure. Don’t you think it’s strange that Peter doesn’t ‘HIDE’ election? The VERY FIRST THING he says to these scattered Christians is they’re ELECT – we debate it today; BUT Peter LEADS with it! He wants our identity not to be first as OUTCAST ALIENS in a foreign world but our identity to be ‘we are CHOSEN BY GOD’! So before we exposit the meaning of verse 2, let’s look at the doctrine of election which is so difficult for many Christians to embrace. ISRAEL was CHOSEN in Deuteronomy 7:6 For you are a holy people to the Lord your God; the Lord your God has chosen you to be a people for His own possession out of all the peoples who are on the face of the earth. JESUS was CHOSEN in Isaiah 42:1 Behold, My Servant, whom I uphold; My chosen one in whom My soul delights. I have put My Spirit upon Him; He will bring forth justice to the nations. Luke 18:7 shall not God bring about justice for His elect, who cry to Him day and night, and will He delay long over them? Romans 11:5 there has also come to be at the present time a remnant according to God’s gracious choice. 2 Timothy 2:10 …I endure all things for the sake of those who are chosen, that they also may obtain the salvation which is in Christ Jesus and with it eternal glory. 2 Thessalonians 2:13 we … give thanks to God for you, brethren … because God has chosen you from the beginning for salvation through sanctification by the Spirit and faith in the truth. Election is taught, assumed, proclaimed and explained ALL throughout the entire bible; it is a thoroughly biblical doctrine. What we are physically because of our physical Father we are spiritually because of our Spiritual Father. 1. How can people be held RESPONSIBLE? How can we be held accountable for believing Christ when God does the Sovereign selecting? Answer: Scripture teaches BOTH, not as an alternatives but as friends, as partners; called an antinomy. Which is… two truths that seem to be opposites yet function in harmony. 2. How can Election be JUST? Is God fair? The issue is not a matter of justice, but mercy! We don’t want justice from God. If we received justice, then we would be rightly condemned to Hell for our sin. Mercy is the issue. And the scripture says, no one seeks for God, all are in sin, all are in rebellion and want to be. The SHOCKING TRUTH is not that God passes up some, but that He chooses any of us! Those who struggle with election are usually VISUALIZING A GOD who is standing at the door of heaven, with people thronging to get in the door, pushing to get through the door WITH God saying to various ones, ‘Yes, you may come, but no not you; and you can, but not you.’ That is NOT what God teaches or describes in His Word. The TRUE picture of scripture is God standing at the door of heaven with His arms outstretched, inviting ALL to come. Yet all men without exception are running in the opposite direction towards hell as hard as they can RUN. So God, in election, graciously reaches out before time and decides to stops this one, and that one, and this one over here, and that one over there, THEN in time, effectually draws them to Himself by changing their hearts, making them willing to come. Election keeps no one out of heaven, who would otherwise have been there, but it keeps a whole multitude of sinners out of hell who otherwise would have been there. Were it not for election, heaven would be an empty place, and hell would be bursting at the seams. 3. If God elects, why should we EVANGELIZE? Why even try to reach the lost if God has sovereignly selected His children? The answer is God has not only chosen people but also has chosen the MEANS by which He will bring salvation to them. The means is the foolishness of preaching through us. Acts 18 is a classic example. Paul was discouraged in ministry, he wanted to give up in Corinth because of all the opposition. But God came to Paul and said keep preaching the gospel, keep teaching the Word of God, for I have many people in this city. But those people were NOT converted yet! That’s RIGHT! God was encouraging Paul to continue His work, since many of God’s elect were in the city. Paul was told to continue ministering there by God so those whom God had elected, would then be called to salvation by God through the preaching of the gospel through the lips of the apostle! How do we know who is elect and who is not? Spurgeon said, “It’s none of your business. You preach to every creature by every means.” He also said, if the elect had a yellow stripe up their back, I would spend my time pulling up shirt tails, but since they don’t, I preach the gospel to ALL men and those who are elect will respond. This puts heart into evangelism. I don’t have to win people intellectually or move people emotionally. The task of evangelism is this; I’m to be an obedient instrument in the hands of a Sovereign God whose saving power goes forth through the medium of the foolishness of the preaching of the weakest beings like me. That puts heart into evangelism. You don’t fully appreciate election unless you completely embrace every person’s inability to respond to the gospel on our own – Election is connected to TOTAL DEPRAVITY. You & I are totally depraved – that doesn’t mean we DROOL, and SMELL like garbage – total depravity speaks of the inability to choose. Ephesians 2:1 And you were dead in your trespasses and sin. DEAD refers to the stench of a corpse – a person so dead they smell; there’s absolutely no life. If you have ever been to a funeral, you know a CORPSE has no ability to choose anything. John MacArthur says, Men, apart from God, are spiritual zombies. They are the walking dead, who do not know they are dead. They go through the motions of life, but they do not possess it. Before God began His work in your heart, you were spiritually dead, with no ability to respond to God, nor choose God. As a result of Adams sin in Genesis 3, all people are spiritually dead, unable to either COMPREHEND or BELIEVE spiritual truths. People are blind and deaf to the message of salvation. This is why Jesus says John 15:16 You did not choose Me, but I chose you. Why must GOD do the choosing? because WE can’t. You say, what a minute – I CHOSE GOD! But let me ask you, was that you or God who enabled you? Did you chose Him or were you dead, then God awakened you in such a manner you could respond by putting your faith in Christ? You see, when you are DEAD, you can’t choose–you can’t respond. There are theologians today who think even though you’re dead, you are still ‘sort of’ alive and can respond! Friends, the bible says, apart from Christ, you are ‘ALL’ DEAD. Romans 3:10 “There is none righteous, not even one; 11 There is none who understands, There is none who seeks for God; 12 All have turned aside, together they have become useless; There is none who does good, There is not even one. John 6:44 “No one can come to Me, unless the Father who sent Me draws him; and I will raise him up on the last day. D. Election is an ENCOURAGING doctrine. It wasn’t YOU who figured out faith in Christ was such a good decision, but it was God who had to awaken your dead heart! You didn’t know how much you needed Christ until He opened your blind eyes and gave you the faith to believe. 2 Peter 1:1 says we receive our faith 1:1 Simon Peter, to those who have received a faith of the same kind as ours, God gives us our faith to believe in Him. Election produces a biblical humility – it was ALL OF GOD & none of you!!! We are predestined before time began and kept all the way through death and heaven. If it were our choice, we could lose it. Because it is God’s choice, it cannot be broken. [golden chain] Romans 8:29 For whom He foreknew, He also predestined to become conformed to the image of His Son, that He might be the first-born among many brethren; 30 and whom He predestined, these He also called; and whom He called, these He also justified; and whom He justified, these He also glorified. 3. Election produces an ETHICAL energy. Why’d God choose us? Ephesians 1:4 says we’re elected to be holy and blameless. He chose us in order that He might change us into the image of the Lord Jesus. Is election WORKING? 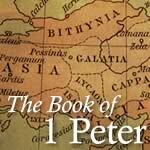 NOW – That’s all INTRODUCTION now look at how 1 Peter encourages those ELECT Christians who are aliens in a foreign land. Look at verse 2 again who are chosen 2 according to the foreknowledge of God the Father, by the sanctifying work of the Spirit, that you may obey Jesus Christ and be sprinkled with His blood: May grace and peace be yours in fullest measure. 1-God’s foreknowledge is God saying, THIS IS MY PEOPLE, that they are mine. Amos 3:2 puts it this way, 3:2 “You only have I chosen among all the families of the earth; … Amos doesn’t mean God is only aware of the existence of Israel but He is acknowledging Israel as His own – His people, His family. The word KNOW which makes up part of this word was used of physical intimacy in the OT and that imagery is carried over in this term. And the Greek word KNOW here is not the knowledge of FACTS but the knowledge of PERSONAL INTIMACY. This is God’s loving care for us before the world was made. God is the one who took the initiative to draw us into an affectionate relationship. Because Greek is built around verbs but there’re no verbs in these first two verses except for the very last phrase, the exact phraseology here says you’re elect aliens scattered by foreknowledge of God the Father, communicating to these distressed Christians that God knew all about what would happen, that He planned for it to happen. The entire GODHEAD had a gracious personal intimate knowledge. It’s as if God is saying to them and us, I understand what you are going through, and as your Father ‘I love you’ my children. Right now, God is saying that, to YOU through HIS WORD here. Hebrews 12:14 SAYS Pursue peace with all men, and the sanctification without which no one will see the Lord. Are you GROWING by the Spirit? Is your calling CERTAIN? Beware – THE religious make excuses for disobedience, defend their spirituality, justify sin, want people to think highly of them, are very concerned about spiritual appearance; but they don’t grow nor obey. But the ELECT GROW; there is increasing freedom from remaining sin and gradual progress in becoming more like Christ in every way. All true Christians GROW… Are you ELECT? God’s purpose for the Christians of 1 Peter and their current situation as elect aliens is for their lives to be leading TOWARD increasing obedience to Christ. When verse 2 says that you may obey Jesus Christ, the greek uses a preposition EIS, which means INTO or TOWARD, into obedience to Jesus Christ you’re headed toward obedience, making progress toward obedience, learning to be MORE obedient. ARE YOU becoming more obedient or less? Let me expose one area of disobedience –Hebrews 10:25 COMMANDS US to not forsaking our own assembling together, as is the habit of some, but encouraging one another; and all the more, as you see the day drawing near. Attendance to weekly worship service is a COMMAND of Christ. Which means A MAJORITY OF OUR CHURCH FAMILY IS IN SIN. We are not a legalistic church; we have no issues with clothing, drinking, smoking cigars, sports involvements, types of schooling. WHY – because that is not biblical obedience, but faithfully attending weekly worship service is obedience to Christ and it is NOT happening at FBC – it is NOT. Jesus says, Luke 6:46 why do you call Me, ‘Lord, Lord,’ and do not do what I say? Either you are NOT his child or you are IN SIN and you need to repent. This is with new & old FBC’ers – don’t call yourself a Christian if you are going to treat obedience to Christ as OPTIONAL, or an after-thought, or a convenience, or when you feel like it, or fitting in obedience when there isn’t anything else going on, or it works if the game is on later or the sports league will accommodate it. It is like obedience to church attendance is an AFTER THOUGHT! There is sin in the camp, it is vial, God hates it, it disgusts Him and it is ACTIVE defiant rebellion against Jesus Christ because every one of you KNOW what the Bible says and it has to STOP now. There is very little genuine REPENTANCE over this issue and it frightens me for you… If 100 of you show up next week but in your heart, you are committed to faithfully attending church in obedience to Christ, that would be better than 600 who’re sinning. Aren’t you glad you are here today? 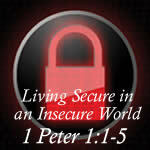 I could add giving faithfully, serving faithfully, guarding your mouth from gossip – OBEY Christ! Not perfectly, but you should be progressing toward obedience not becoming more casual about it. Obedience is not earning points; Obedience is from a heart that seeks to please and a heart that LISTENS to its master, Lord and King and desires to respond. It’s true, obedience to Christ will never be complete in this life, even the most mature Christians are painfully aware of remaining sin. So Peter reminds them that their lives will also be leading toward verse 2 and be sprinkled with His blood: These are super encouraging words using an OT visual reminder that ‘A’ LIFE …has been given; a sacrifice has been paid. In the OT most of the sacrifices involved the sprinkling of blood and sometimes that blood was actually sprinkled on people; like the leper or skin diseased person who would be UNCLEAN. This sprinkling was designed to take care of defilement and here this sprinkling was to cover ALL defilement that would disrupt fellowship with God. We’re elect by a gracious Father who loved us before the earth was created; chosen for the Spirit to mold us into the image of Christ, and selected to obey Christ’s commands and follow His Word! But when we don’t measure up, Peter reminds his readers the blood of Christ gives us continual restoration of fellowship with God. NEVER that we say, well God will forgive, God is gracious… but when we fail; we’re covered by the blood and our sins are forgiven. God’s plan for us is not obedience marred by unforgiven sins, but Christians whose stumblings are cleansed by the blood of Christ. We are elect; chosen by God; given salvation; God saves sinners; and at no point do we ever earn forgiveness or earn God’s love. But we are elect to be sanctified and we are elect to obey – something the born again heart will WANT to do and PURSUE! The final phrase of verse 2 May grace and peace be yours in fullest measure. The OT blessing of peace SHALOM and the NT blessing of grace give all believers, jew and gentile a taste of God’s favor toward his people. The only verb in the first two verses is here, in fullest measure. It is in an unusual MOOD, giving it the idea of a WISH! Peter says, I WISH this for you. You’ve tasted of God’s peace and know of God’s grace, so I wish ALL your moments, while exiles scattered to foreign lands will be SATURATED with these blessings. I wish for you to be overflowing with God’s undeserved grace and peace and I wish for you to experience ALL OF IT in the fullest measure; multiplied, growing and overflowing. And much of that overflow will come when you fully embrace the TRUTH that you are CHOSEN–living everyday with this THOUGHT. Out of all of rebellious sinful hateful humanity, God chose you. Before creation he loved you, is sanctifying you & will cause you to obey. And ALL those who follow Him in this life, will definitely be those who follow Him all the way HOME to heaven. JOYFUL – God made you His own, when you were shaking your fist at Him. DESIRING TO CHANGE – Election is a great motivation for us to live obediently. If God would do all this for me, how could I not live for Him? GOD CENTERED – you will be overwhelmed by the work of God for you in the past, the present and the future – you will be saturated with our GOD!